DAMASCUS, Md. January 31, 2009: For many, the idea of having what seems like 6,000 errands to do is perfectly feasible. For doing them, direct your eyes toward the 2009 Ford Escape Hybrid -- a delightful little runabout that will make those errand days more enjoyable. For some time the Escape has been one of my favorite SUVs thanks to its styling and size. Add the hybrid technology, and that should be enough to keep owners from breaking out in a cold sweat if the price of gasoline heads sharply higher again. At 174.7 inches long and riding on a 103-inch wheelbase, the Escape is shorter than a Nissan Rogue and bigger than a Honda Element. With a minimum ground clearance of 8.3 inches some modest off-road activity might be attempted with the four-wheel drive version. 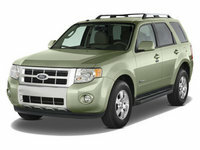 For 2009, the Escape Hybrid gets a new 2.5-liter I-4 engine that is good for 153 horsepower and 136 lb-ft of torque. It is mated to a nice continuously variable transmission. Zero to 60, if that matters here, should come in the 9-second range. It has more than enough scoot for getting around town, and a nice tight turning radius for supermarket, pharmacy and mall parking lots. The EPA rates the Hybrid with front wheel drive at 31 miles per gallon on the highway, and 34 around town, which is easy to take on errand days. If you coast into the service station on minus empty, a fill up of unleaded regular at the $1.79 level should set you back an easy-to-take $26.85 -- a bit less than an Expedition. There is also Ford's capless refueling system. Ford (F) gets a demerit or two for substituting drum brakes in the rear for the all-around disks of the previous model. Inside, the Escape is as comfortable as ever for someone 72 inches tall. You should be able to fit three kids in the back or three adults for shorter trips. With the second row of seats up, there is 28 cubic feet of space available. Fold them down (taking time out to remove the headrests), and you end up with 66 cubic feet of storage. Ford rates maximum towing capacity at 1,000 pounds, properly equipped. Most controls came readily to hand, but some of the radio controls were included in the optional $2,395 navigation system. I feel strongly that sounds and directions should go their separate ways. The top of the line Hybrid Limited comes with 16" wheels, a six-disc CD changer, chrome and ebony interior trim, heated front leather seats and a power moonroof. Of course, there is Ford's Sync System. Ford offers a 3-year, 36,000-mile warranty bumper to bumper and an 8-year, 100,000-mile warranty on the hybrid-specific components. Out on the road, the Ford was more than able to keep up with traffic and cruise nicely on the interstates. Handling was what a typical driver would expect in this type of vehicle. The suspension was tweaked for 2009 to improve the ride, and I would say Ford hit a homer on that one. The little 4-cylinder was not as refined as some competitors were, but generally was a quiet highway cruiser. If you are downsizing the family garage one day, a test drive in an Escape Hybrid would be in order.